The ASEAN-QA project is divided into different phases. The following page provides information about current, third TrainIQA phase, which takes place between 2016 and 2018, and the appendant workshops and conferences. After completion of the third phase of the ASEAN-QA training course, the participants are expected to be able to understand theoretical concepts of quality, quality assurance and quality enhancement and have the ability to evaluate them according to the various visions and missions of higher education institutions. Moreover, they will learn to design and carry out questionnaires and evaluations scientifically and to control the related processes. To establish a sustainable quality assurance system with follow-up-processes on all levels of the higher education institution, the participants will also be taught how to apply appropriate techniques and scientific methods to reflect upon the results of quality assurance and how quality culture can be developed at the institutional level. An institutional focus is also generated by the recognition of cross connections between quality development, staff development and organisational development. 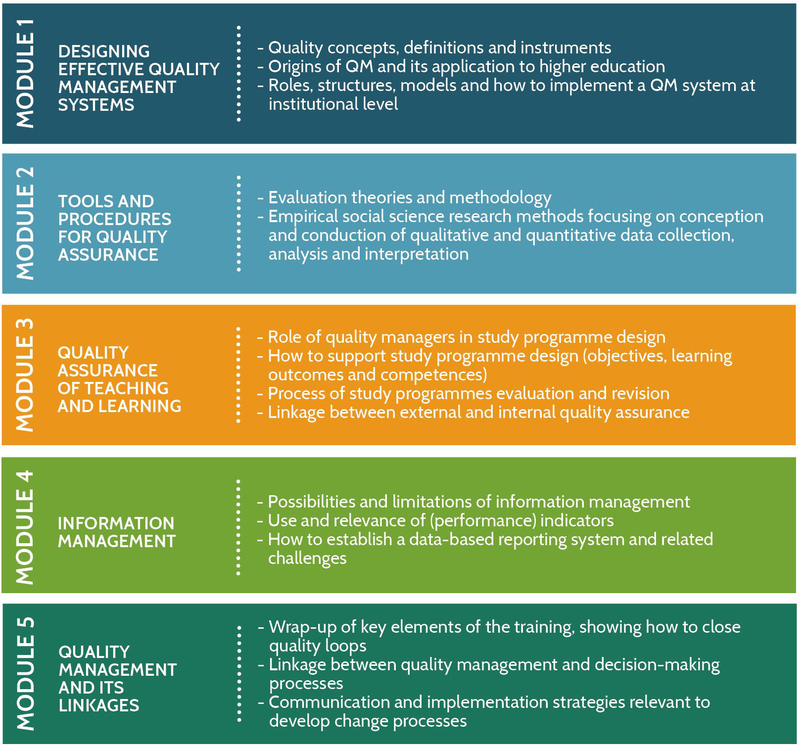 The last important field of the training is the requirements of quality assurance of study programmes and their revision, including the linkage to external quality assurance, and how to deal with them. The new project phase officially starts with the High Level Visit, where the leadership of all participating universities come together to discuss quality assurance at higher education institutions with a focus on their own role and the supervision of the project. The presidents and vice-presidents will meet again during the final conference in 2018, which directly follows the last TrainIQA workshop and aims to inform all stakeholders about the outcome and the follow-up activities. In between, the quality managers accepted for the training will work step-by-step on the different modules, with module four being included in all workshops and working phases. Each module has an accompanying course book used as preparatory reading and general resource. The participants are further expected to implement institutional projects in the field of QA that are linked to the university’s strategy and supported by higher management. The projects are mentored by ASEAN and European experts in the field throughout the training, which is based on a blended learning concept. Therefore, additional to the course books and workshops, online phases and online consulting are provided via a common online learning platform.